We’d love your help. Let us know what’s wrong with this preview of The Theory of Money and Credit by Ludwig von Mises. The Theory of Money and Credit integrated monetary theory into the main body of economic analysis for the first time, providing fresh, new insights into the nature of money and its role in the economy and bringing Mises into the front rank of European economists.The Theory of Money and Credit also presented a new monetary theory of the trade cycle, which, under further d The Theory of Money and Credit integrated monetary theory into the main body of economic analysis for the first time, providing fresh, new insights into the nature of money and its role in the economy and bringing Mises into the front rank of European economists.The Theory of Money and Credit also presented a new monetary theory of the trade cycle, which, under further development by Mises’s student Nobel Laureate F. A. Hayek, came to challenge all previous trade-cycle theories. To ask other readers questions about The Theory of Money and Credit, please sign up. If you want to become like Jim Rogers, Marc Faber, Peter Schiff, you need to read and understand this book, otherwise you will be only an amateur on financial markets, this book alone with Mises 1928 monograph are the best books on money ever, becareful you need to have some background on Menger,Bohm-Bawerk and Banking theories, Take a breath and open your mind into the best book on money ever ! As most of the Western world continues to believe that monetization of debt has no real consequences, it is important to point out that not everyone shares this view. 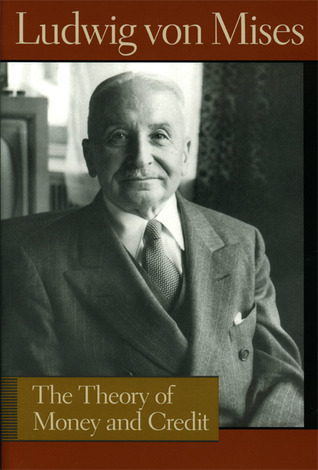 Ludwig von Mises's The Theory of Money and Credit takes the opposite view. This book belongs to what is called "The Austrian School" - the concept that the expansion of the money supply and/or credit will have real - although not always apparent - consequences. The heart of much contention is a debate over the nature of economic acti As most of the Western world continues to believe that monetization of debt has no real consequences, it is important to point out that not everyone shares this view. The heart of much contention is a debate over the nature of economic activity. Is the economy largely organic or is the economy basically created and guided by the state? Von Mises, of course, believes that the economy functions best without government intervention in the money supply (which can take many forms). This is a debate that many people are having, and it behooves you to read up on more specific points like the business cycle, potential price distortions in the market, demand, and international trade. a dense and somewhat difficult book on the nature of money, the reasons for interest, the effects of inflation, and the justifications for metal currency. The arguments that it refutes soundly I still hear today, but they are no more correct now than then, and I think this holds up quite well with the passing of time, and is a good point of reference for arguments against deficit spending and inflationary policies. Far more self consistent than the competition. 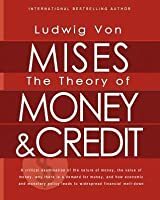 Being on a particular topic in economics, The Theory of Money and Credit struck me as a clearer and more focused effort than did Mises's magnus opus, the possibly better-known Human Action. There is no waxing on the virtues of praxeology here; instead, Mises writes exhaustively and with precision solely on the natures of money and credit, and almost always with a dispassionate, analytical, and careful disposition (pace Rothbard, for example). The result is a lengthy tome on money and credit, wri Being on a particular topic in economics, The Theory of Money and Credit struck me as a clearer and more focused effort than did Mises's magnus opus, the possibly better-known Human Action. There is no waxing on the virtues of praxeology here; instead, Mises writes exhaustively and with precision solely on the natures of money and credit, and almost always with a dispassionate, analytical, and careful disposition (pace Rothbard, for example). The result is a lengthy tome on money and credit, written by a master, as far as one could understand the subject prior to the Great Depression. Amazing concepts, more about currency than economy. Very hard to read, doesn't flow well, but the single line quotes are among the best you'll find in any novel. "Arguments from authority are invalid; the proof of a theory is in its reasoning, not in its sponsorship." "The increase in the quantity of money does not mean an increase of income for all individuals. On the contrary, those sections of the community that are the last to be reached by the additional quantity of money have their incomes reduced, as a consequence of the decrease in the value of money called forth by the increase in its quantity." "There cannot be stable money within an environment dominated by ideologies hostile to the preservation of economic freedom...The ruling parties will certainly not consent to reforms that would deprive them of their most formidable weapon, inflation. Monetary reconstruction presupposes...an unconditional rejection of those allegedly progressive policies...designated by the slogans New Deal and Fair Deal." Es otra de las obras de economistas austríacos que describen la realidad actual, a pesar de que tiene más de 100 años de haber sido publicado, en este se explica con detalle el ciclo económico y cómo debido a la manipulación centralizada del dinero pueden causar crisis económicas, es decir, las deliberadas y arbitrarias medidas de los banco centrales crean señales erróneas en el mercado sobre el comportamiento del dinero creando la típicas burbujas que conocemos actualmente. Me sorprende que esta Es otra de las obras de economistas austríacos que describen la realidad actual, a pesar de que tiene más de 100 años de haber sido publicado, en este se explica con detalle el ciclo económico y cómo debido a la manipulación centralizada del dinero pueden causar crisis económicas, es decir, las deliberadas y arbitrarias medidas de los banco centrales crean señales erróneas en el mercado sobre el comportamiento del dinero creando la típicas burbujas que conocemos actualmente. I've read many books that could be described as dry or dense and they all seem to deal with the field of economics. I didn't find much to really disagree with but I also didn't find a whole lot that really stuck with me, either. I found myself skimming over large sections of review of 19th century economics/economic theory or sections that just repeated what the author had said already or sections that stated the obvious. Not worth the time in my opinion. Alright this book took me sometime to digest. It wasn't that Mises wasn't clear enough, I just lacked the education to comprehend his theories in total. I would say the Theory of Moeny and Credit is for those who have already grasped the basics of the Austrian school and want to push a little deeper. A great book but know that you are taking on a giant here with giant ideas. Start with Hazlitt in Economics in One Lesson first. Many of Mises' works are clear and highly readable. The Theory of Money and Credit (as one of his earliest works, written in German) was translated in a relatively complicated style, and requires a bit more concentration than his other works. written over 100 years ago--still fresh. Only for those who really have a thirst to understand the subject. Very interesting read, but very, very long winded. His description of how money evolved was great. His view on how booms becomes busts is on point. In light of QE3 and reading this book I am now terrified of inflation. This was not as difficult to read as I expected, but it was difficult to truly understand. It's a classic, so I'm glad to have read it. This is a difficult book to read, though if you slog through it, you will learn quite a bit. great book on theory. heavy though like a text book. fine print too. Ludwig Heinrich Edler von Mises (German pronunciation: [ˈluːtvɪç fɔn ˈmiːzəs]; September 29, 1881 – October 10, 1973) was an Austrian economist, historian, philosopher, author, and classical liberal who had a significant influence on the modern free-market libertarian movement and the Austrian School.